This is a new one for this blog, a completely new Restaurant of the Week post about a restaurant I’ve posted about before. In this case, Dolce remodeled, added a bar and sharpened its focus, going from French-American bistro food to American gastropub. Hence, even though the owner is the same, the old review scarcely applies anymore. 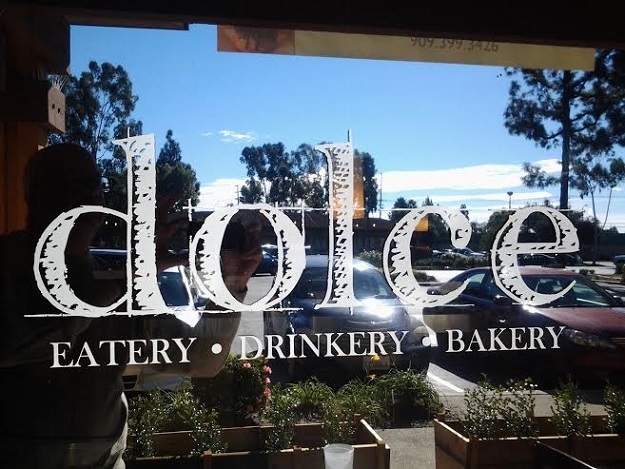 I liked the old Dolce, but I like the new Dolce better. It’s still too vast, seating 150, but a wedge-shaped area that was only lightly used is now a bar, a smart move. 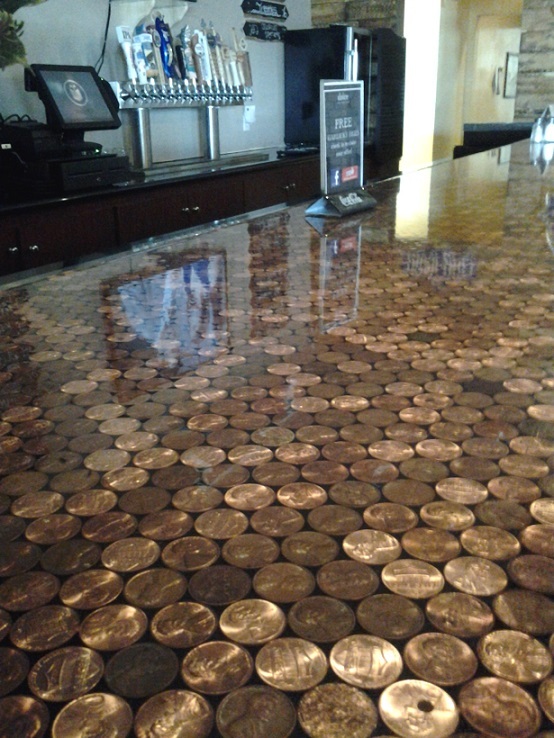 Under the glass bartop lie rows of pennies, said to be $70 worth. The restaurant lighting is still too dim for me — it’s difficult to read anywhere but outdoors or in the cafe seating by the windows — but at least as a gastropub the atmospheric lighting is logical. The menu is shorter and punchier. They do breakfast on weekends. A Florentine scrambler ($8) with bacon, English muffin and crisp potatoes was one of the finer Inland Valley breakfasts I’ve had. On another visit a yogurt parfait with fresh fruit ($5-ish) was okay, but I had expected more fruit and more than a thimbleful of granola. At lunchtime, I’ve enjoyed a short rib Mac and Cheese grilled cheese ($12), with Korean short ribs and macaroni and cheese between sourdough, better than the Grilled Cheese Truck version. On a visit with friends, we had two burgers, the not so classic ($10, bottom) and the classic ($7), the not-so having roasted tomato, red onion marmalade, fontina cheese and “bacon jam.” Both came on fresh-baked peppercorn buns. 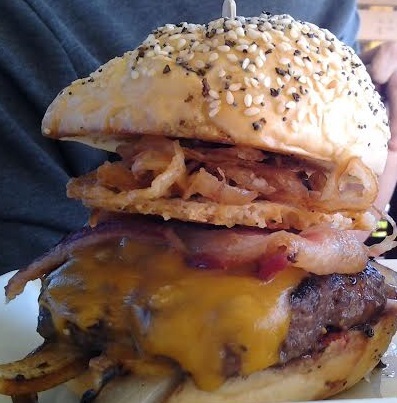 The burgers were a cut above, if a shade below Eureka’s level. The third got a decent ahi salad ($12). We did notice that vegetarian items are virtually nonexistent. 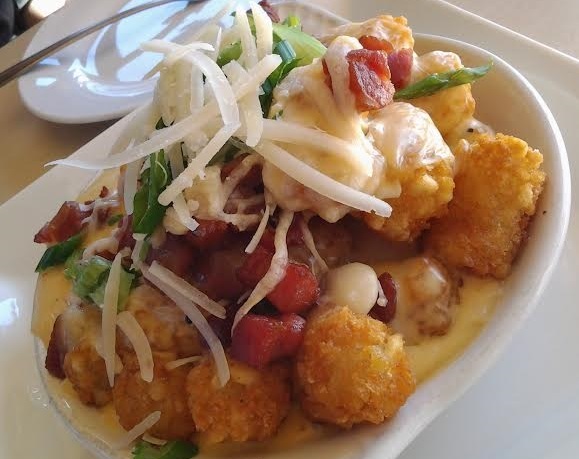 Oh, and we shared an appetizer, cheesy tots ($6, below), a clear winner, as excellent as they look. I’d say Dolce’s makeover was a good step. As before, items are prepared with an eye toward freshness, quality ingredients and creativity, but the menu and the setting seem to gel better this go-round. One of my new favorite restaurants. And they still have their bakery. I always like the old Dolce, too, although every time I went in there for lunch, there were very few people. I always wondered how they stayed in business. I’ll have to try the new Dolce soon! I can only assume the catering side pays the rent. I hope this new incarnation clicks! We liked the old Dolce a lot. I hope the new focus works. My vegetarian friends are left out except for weekend breakfast. A new space division diverts attention from the over large size. (I once bought a Gateway computer over along the east wall in a former incarnation of the place.) I admire owner Alice and her creativity. Dolce still has the best cakes around.